Trying to ensure that the brains and experience of all participants are brought into the room is one of the more enjoyable challenges of facilitation. It’s mainly a question of finding the right balance of different approaches since there are so many formats that provide opportunities for different combinations of people to share knowledge and questions. Our knowledge of those formats comes from ideas and stories freely shared by other facilitators, in person or via resource bases like the KS Toolkit. We do a lot of event facilitation using those ideas so to give back to the Commons we’re sharing here some recent workshop experience. One element of a good balance is to do with mixing up deliberately ‘leaderless moments’, where natural leaders or burning discussion topics can fill the space, with more structured processes such as those that promote particular people as conversation guides, or even gurus, around whose ideas and presentation discussion flows. Samoan circles and Fishbowl formats can lend themselves to most points along that spectrum of options, and we happily experimented with two variants at the recent annual workshop of a large Sanitation programme. At its core it’s a simple method: a small group of people have a conversation amongst a wider group of participants. The difference with panels, for example, is that the small group sit in a circle surrounded by the participants. Samoan circles are possibly the purest form of the approach. In this format the central group begin discussing the topic. People in the outer circle cannot speak unless they replace one of the speakers in the centre. If somebody wants to participate, she taps one of the current speakers on the shoulder as a sign of intent that she wishes to replace one of the current speakers in the circle. The conversation continues until the time is up or the conversation dies. The democratising nature of the format generates a particular energy that drives people into the inner circle, in an active and engaged way. And crucially, people are able to intervene at precisely the point in the conversation which engages them, rather than having to wait and ask questions later, that then take people backwards to an earlier point. As a consequence conversation tends to flow organically– assuming of course that the chosen topic is interesting to the participants and that they are comfortable with and trusting of each other. It’s not a tool to use very early in a workshop. The excellent Liberating Structures group propose a variant, in which the outer circle ask questions, but not randomly. At a given point the conversation in the middle stops and the outer circle talk among themselves, agreeing questions, which they then put to the speakers. Peter Feldman, one of the main organisers of our recent sanitation workshop, proposed a variant in which there were two spare chairs in the central circle. The central speakers stayed in the ring and other participants could join the conversation by sitting in one of the empty chairs, or join by following the tapping convention to replace one of the speakers, but only those in the extra chairs. We used the Samoan circle and the Feldman variation in the workshop, in two sessions, one focusing on Sanitation financing and the other on Behaviour change. The choice of topics meant that there were many people with ideas and opinions to contribute but it was interesting to see how the two formats operated. We used the Feldman variation for the Financing discussion, partly because we believed there was a great divergence of experience amongst participants, so having a group more familiar with different approaches operating as an expert panel seemed appropriate. The format engaged more participants in the conversation than would be normal in a traditional panel discussion, partly because the conversation didn’t always return to the experts but followed on from ideas introduced by the ‘outer circle’. However, having one group of people always present meant that the conversation was anchored by their experience and confidence in speaking about the topic. For the Behaviour Change conversation we used the Samoan circle format. The topic and the format generated a lot of debate, lasting a full 90 minutes - at the end of a long day, and the fourth day of the workshop at that. However, the conversation ranged around the interests and opinions of participants and wasn't anchored in the same way. Our conclusion was that in this format someone, either the facilitators or a participant, needs to step forward pro-actively, intervening to summarise, reflect back opinions so far and point out questions that hadn’t been properly answered or addressed. The workshop was organised around wide range of activities, including two straight-forward presentation and discussion sessions, world cafes, 1-2-4-All, field visit and feedback sessions, spectrogram exercises, group discussions - and the emergent conversations above. That variety scratches all the itches - allowing participants time to listen, reflect and engage participatively both individually and collectively. It's probably one of the reasons why participants were so positive about the Fishbowl exercises, which they were. Organising opportunities for participants to stretch both their legs and brains in stimulating conversations about issues that matter to them is a great way to earn a living! 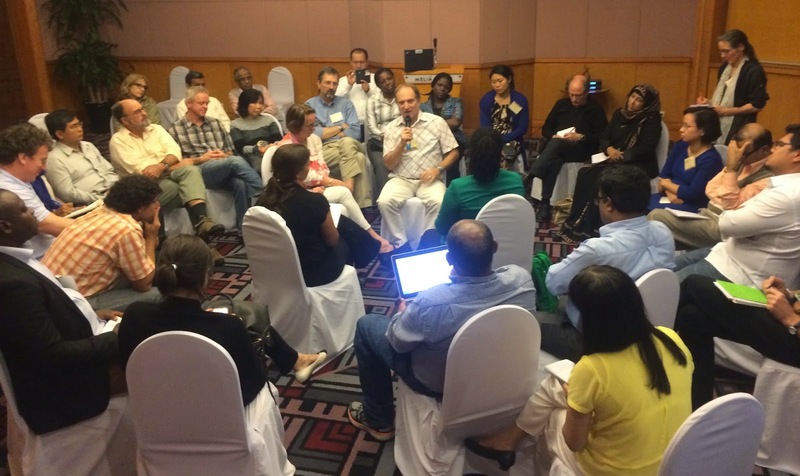 And apologies to co-facilitators and participants at the 2015 BDS convening, I was calling this a fishbowl!